On stand N5081 at Naidex 2019, Topro will be exhibiting examples from its comprehensive range of rollators and visitors to the stand can enter Topro’s Naidex competition and be in with the chance of winning a £50 John Lewis voucher. One of Topro’s most popular products, the Rollz Motion 2, is a strong, lightweight rollator and wheelchair in one, which is available in four colours (island blue, pebble white, matt black and dark purple). Offering “superb” levels of manoeuvrability, stability, comfort and convenience, the Rollz Motion 2 switches from a rollator to a wheelchair with ease. It has a maximum user weight of 125kg, seat dimensions of 42cm x 45cm x 55cm and a minimum and maximum user height of 1.60m to 1.90m. 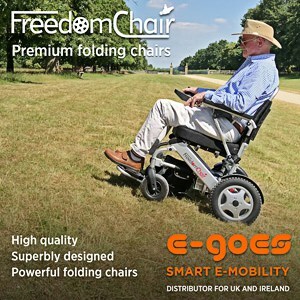 The Rollz Motion 2 also has a shopping bag volume of 10 kg, which Topro says makes it the ideal mobility solution for anyone that wishes to enjoy a day out with the peace of mind that should they need to rest, they can do so. Complementing the Rollz Motion 2 will be other products from the Topro portfolio, such as the Troja 2G and Troja Forearm Walker. The Troja 2G is available with resistant brakes and single sided brake options. Colour options include: Pink, Grey, Silver, Capri Blue, Red and White. Available in sizes Small (user height – 135-170cm, max user weight – 125kg, seat height – 54cm) and Medium (user height – 150-200cm, max user weight – 150kg, seat height – 62cm,), standard features include the Comfort Soft (PUR) quick release wheels, ergo grips and a matching padded shopping bag. Topro offers group demonstrations, retailer and staff training, and individual client assessment on site or in a client’s home as well as an extensive training and customer service programme to assist retailers, end users and healthcare professionals both before and after purchase. All rollators come with a 7-year warranty and additional options include a one-sided brake and a drag brake. There is also a wide selection of additional accessories available. The Topro ethos is based on the importance of testing and obtaining international approval of its rehabilitation products. All Topro products are tested and approved at official independent test institutes (TÜV in Germany and HMI in Denmark) in accordance with relevant international standards and EU directives.